The second MAHS Field School of the year was conducted on July 10-13, 2003 in Key Largo, Florida. This was the first initiative in what is anticipated to be an ongoing relationship between MAHS and NOAA?s Florida Keys National Marine Sanctuary (FKNMS). One goal of the field school was to train MAHS students in basic site survey and mapping techniques. 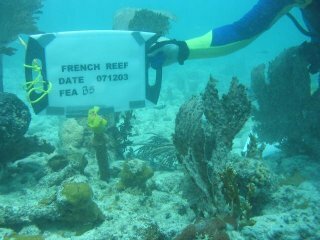 In addition, the team endeavored to provide FKNMS with a credible and useful site map of an unidentified shipwreck lying on French Reef near Key Largo. Pretty ambitious plans for only two days of diving! As a result of considerable planning and cooperation between many parties, the consensus was that both objectives were achieved with great success. The following MAHS trainers provided technical guidance and logistical support: Steven Anthony, President; Tom Berkey, Education Director; Ray Hayes, Vice President; Jim Smailes, Secretary; and Karin Sinniger, a MAHS member from the Windy City. Students in attendance were Michele Anthony, Wayne Briggs, Angela Griffis, Jesse Griffis, Ed Mahan, and Terry Sumpter. MAHS is especially grateful for all of the support and assistance provided by FKNMS Upper Keys Regional Manager, David Score, and the dedicated office and field support provided by his administrative manager, Brenda Altmeier. Brenda and her husband Bernie Altmeier were immensely helpful throughout our stay and they both went beyond the call of duty to ensure the field school was a success. Thanks to Brenda, MAHS was able to secure comfortable and reasonably priced accommodations at Dr. William Fitt?s Key Largo Marine Research Laboratory located on beautiful Buttonwood Bay. Special recognition is also extended to Denis Trelewizc, a volunteer with the FKNMS Submerged Resources Inventory Program. Denis shared a wealth of historic information about this and other local shipwrecks and provided indispensable logistical support throughout all phases of the project. Upon arriving on Thursday, Dave and Denis dropped by Dr. Fitt's place to discuss the project plans briefly. Everyone was enthusiastic and optimistic, and the NOAA folks expressed their appreciation to the MAHS team for volunteering their time and assistance. On Friday morning, Ray led the students through a land trilateration and mapping exercise. While the students were going through their paces, the rest of the trainers reconnoitered the wreck site. They set up a baseline and transect for reference purposes, tagged specific artifacts for trilateration, and decided upon the survey strategy. Friday afternoon the students were transported to the site for their first dive on the wreck. Two boats with crew were graciously provided gratis to the MAHS survey teams by FKNMS. Captain Ken and Linda Smith furnished their vessel, Island Girl, for two of the MAHS teams and Mitch O?Connor furnished his vessel, Expedition II, for the other two teams. These vessels served as our base for onsite operations. After a short boat ride to French Reef, a final briefing was held, survey quadrants were assigned, and down to the bottom we went! We found the wreck at about twenty feet. It had very little relief (as you might expect since this was a primarily wooden ship). 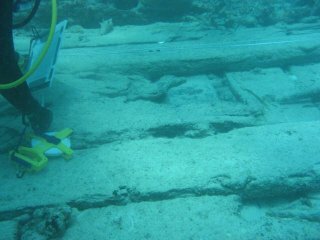 Large timbers were lying prominently in the sand, and encrusted artifacts were scattered about. As this was a non-intrusive survey, everything was left in situ and there was no attempt to uncover or excavating anything. The most distinctive feature was a large capstan, located near the intersection of the baseline and transect. On this dive, visibility had deteriorated to about thirty feet or so, and there was moderate surge which added to the challenge of taking and recording measurements. However, there was plenty of bottom time so we didn?t feel rushed. After the dive, we motored ?home?, cleaned and stowed our gear, and enjoyed a cookout with some of the NOAA folks and the skippers and crew as our guests. Later that evening, the data that we recovered during the day was plotted on the site map. It looked pretty good for our first pass. Missing data was identified, and plans were made for Saturday?s dives. On Saturday, visibility had improved quite a bit and the surge had diminished; all-in-all a beautiful dive (wish you were there David Howe). Surveying of the essential features was pretty much completed by the end of the first dive. On the second dive, students were provided with disposable underwater cameras to try their hands at photo documentation of artifacts. This isn?t as easy as it sounds. Again, the surge contributed significantly to the experience. Compounding (confounding?) the exercise was the need to include in the photograph a signboard bearing relevant information regarding the artifact. This was a bit like a slow-motion rodeo at times, though eventually one learned to anticipate and compensate for the swaying environment. Fortunately, Ray was the project videographer and was able to capture a comprehensive visual record of the site. At the conclusion of the second dive, all reference lines and feature tags were removed, creating a very different view of the wreck. Without the demarcations and artifices, the ship became an apparition. I spent several minutes swimming about its remains, quietly pondering its history and the stories of its crew. If only those timbers could talk.